Plenty of companies have tried their hand at health and fitness apps and services over the past year, but app specialists Tactio are tapping into a niche by producing lots of products specially aimed at teens and younger people who want to be healthier. 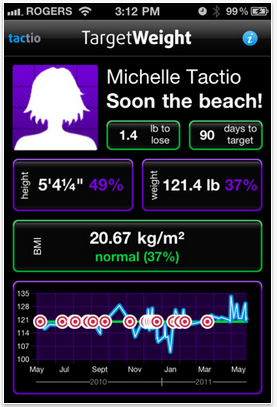 Tactio is already a prominent player in the mobile health arena, with apps like TactioHealth proving popular among those looking for a comprehensive health tracking solution, but what makes the company stand out is its apps aimed at younger people, like Target Weight for Teens, Teen BMI and BMI 4 Teens. Of course mobile users of all ages can use the apps that are primarily aimed at adults, but Tactio has created apps with easier to use interfaces, bright colours, simpler language and charts and activity trackers for those that may not be as used to monitoring everything they do with their phones. Given that teenage obesity is such an important issue in many countries across the globe it’s great to see a company take a tailored approach and bring tools to the gadgets that teens use the most, their mobiles. Target Weight for Teens is available from iTunes for 69p.